George Washington's hairstyle is iconic. It's simple enough that most Americans can probably recall it in an instant. Or they can at least refresh their memory. Just take out a dollar bill or a quarter and see. "Turns out, that hair was his. All of it. The pigtail. The poofy part in the back. That roll of perfect curls near his neck. What's more, he wasn't white-haired. There's a painting of him as a young man. He's with Martha and her two children. It shows his hair as reddish brown, which Chernow says was his true color." 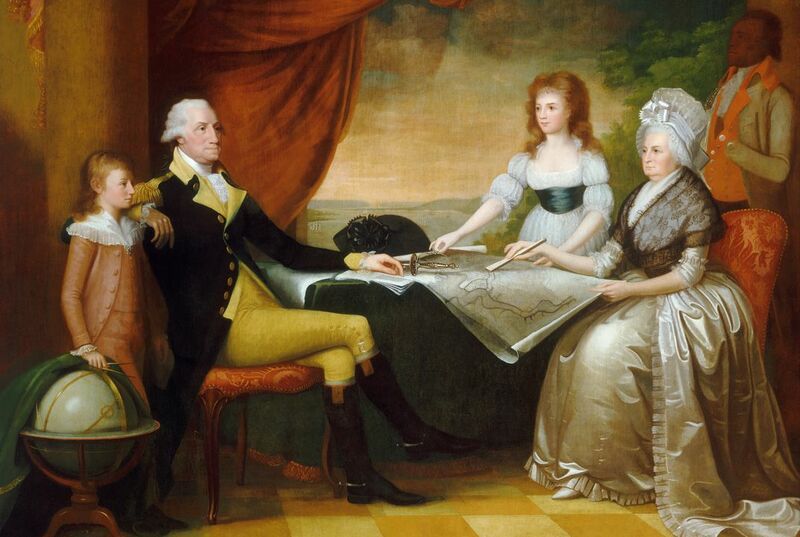 The painting is The Courtship of Washington by John C. McRae. It was painted in 1860. That was long after Washington's death in 1799. But a project out of the University of Virginia called The Papers of George Washington also confirms that the first president's natural hair color was light brown. The style he favored wasn't fancy. Though it may appear so to modern eyes. It was a military style called a queue. (the word is pronounced "cue") It was "the 18th-century equivalent of a marine buzz cut," Krulwich writes. With charming illustrations, artist Wendy MacNaughton brings to life Washington's routine. It included the gathering, enthusiastic yank back. That was to try and broaden the forehead. Then there was the fluffing of the hair on the side and the powdering. Washington didn't wear a wig as some of his equals sported. But, he did powder his hair. It gave it that white look. It may also have been the fashion in America to wear less elaborate wig styles. That is if one wore a wig at all. "Betty Myers is a master wigmaker at Colonial Williamsburg in Virginia. She says that's why Washington bunched his ponytail into a silk bag. To keep from leaving a white windshield wiper splay of powder on his back when he was dancing with the ladies. As for keeping the powder off one's shoulders? How Washington did that, if he did do that, nobody could tell me. Probably every powder-wearing guy in the 1760s knew the secret. But after a couple of centuries, whatever Washington did to stay spotless is lost to us." It's possible that the same solution that helped Washington's hair rolls stay fluffy also kept the powder sticking. It was greasy hair. And it had lots of pomade. Back then, bathing and washing hair frequently wasn't a popular activity. So powders also solved the problem of smelly unwashed heads. The powders were perfumed. It's a good thing fashions change. Because everything like dollars or quarters show him with white hair. We remember his hair white is because his face is on the dollar bill. It looks that way in the dollar bill and he made his hair white but as a kid he had regular hair color. 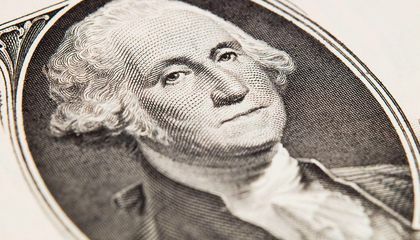 We remember George Washington's hair as white because on the dollar bill it was white. Because on the quarter and the dollar bill his hair is white. We remember George Washington's hair as white because in dollars shownhim white hair. Also, most people draw his hair white.